Does this blondie need much of an introduction? Has any blondie ever needed any sort of introduction? Doubtful. 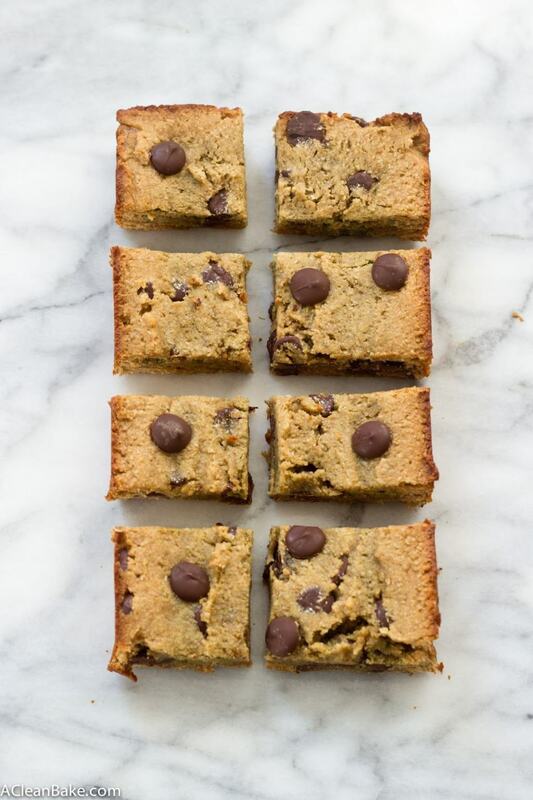 Ever since these cookies, I have had a hankering for grain-free blondies. Like the cookies, they are satisfyingly thick and pillowy soft, to the extent that biting into them is actually kind of relaxing in a really bizarro way. But they are even more moist than the cookies, if you had believe that. The extra moisture is thanks to the addition of sunflower butter (which, to the unfamiliar, is basically the equivalent of peanut butter, but sunflower seeds are pureed instead of peanuts), which I like to use as the base of these because peanut butter has too strong of a flavor and almonds, or rather their flour, are already pretty heavily represented in the ingredient list. Sun butter has a wonderful texture and one of the more neutral flavors of the nut/seed butters, in my opinion. 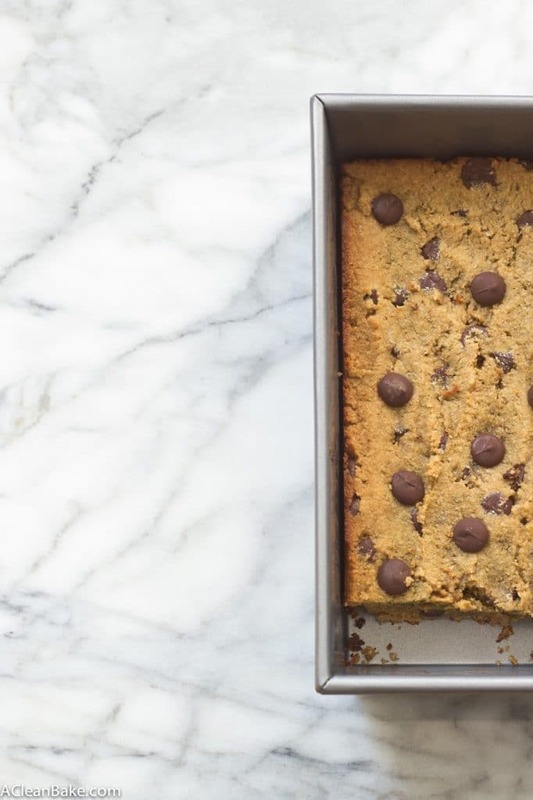 It works perfectly as a base for a bar cookie. What’s the catch, you ask? I wish I could tell you that there isn’t one, but there is (it’s a tiny one): Unlike peanuts or almonds, sunflower seeds contain an enzyme called chlorogenic acid, which reacts with baking soda and results in a greenish hue (source) after they have had a chance to sit for a little while. 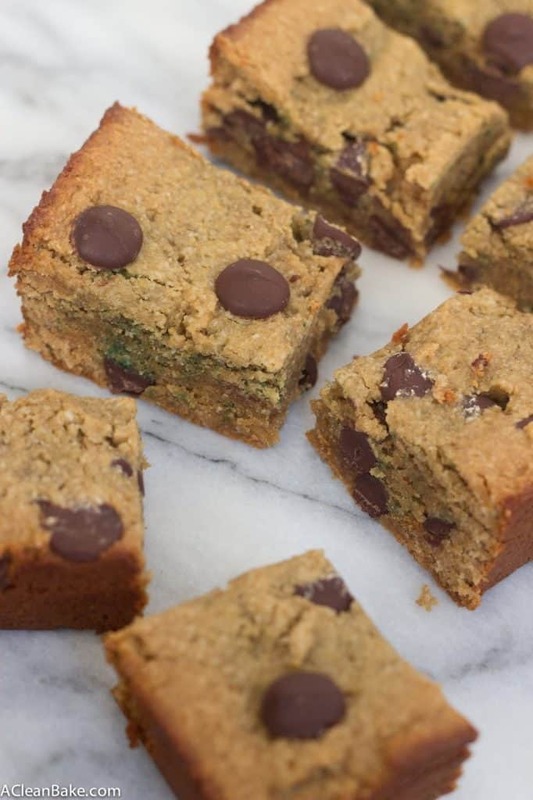 Luckily, this recipe doesn’t contain much sun butter or baking soda so the reaction is minimal – in fact, it looks like you mixed green sanding sugar into the batter – and it took about 12-24 hours to appear. You can see it in the photos below, if you look very closely. See? It’s really no big deal. If it bothers you, you can swap in peanut or almond butter, or even cashew butter for extra super creaminess. But we ate them with the festive green flecks and were so distracted by the taste that we didn’t even notice. In fact, it took me some time to convince the people who ate them that they were, indeed, “healthy”. No one thought it was possible that these contain no flour, butter or sugar. Don’t believe me? Give them a try and see what you think! Preheat the oven to 350F. Grease a 12" rectangular tart pan or an 8" square baking dish and set aside. In a large mixing bowl, whisk together the dry ingredients (almond flour, coconut flour, salt and baking soda). In another bowl, beat the egg, and then stir in the rest of the wet ingredients (nut butter, honey, vanilla, and almond milk) until smooth and completely combined. Pour the wet ingredients into the dry ingredients and stir to completely combine. If you prefer a sweeter taste, add coconut sugar until you get the flavor you desire. Pour batter into prepared pan and gently smooth into an even layer. The batter will be very thick, so be sure to work it into the corners, etc. Garnish with a sprinkle of coarse salt, if desired. Bake for about 15-20 minutes and cool completely before slicing. After about a day, the baking soda begins to react with an enzyme called chlorogenic acid in the sun butter, resulting in tiny green flecks in the bars. It's actually sort of pretty, and looks like you stirred green sanding sugar into the blondies. But if that bothers you, simply replace the sun butter with peanut butter, almond butter or another favorite nut butter. Whatever you use, make sure you use a creamy, unsweetened, natural variety that has been very well stirred to the point where it is nearly pourable. That ensures the oil is evenly distributed and the recipe will contain the right amount of fat, which is vital to the texture. My batch was perfect after 19 minutes of baking time, but the tester did not come out entirely clean. That's because these continue to cook and firm up as they cool. I know it's a lot to ask but they have to cool to room temperature (or be chilled in the fridge) before slicing, or else they will totally fall apart. Store in an airtight container at room temperature for up to 5 days or in the freezer for up to 3 months. I was excited to make these, but something is definitely wrong with the recipe…….There aren’t enough wet ingredients and I ended up with a dry crumbly batter instead of something pourable. ?? I am looking at the crumbles wondering what to do…….I guess I’ll add almond milk until it’s batter like consistency. ?? Ok, ther are out of the oven and I’m not impressed at all. 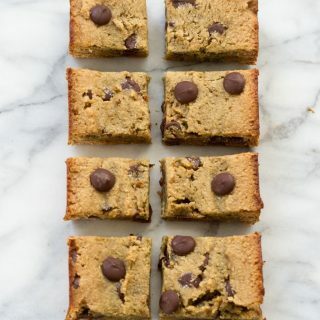 Blondies are supposed to be gooey in the middle, these are pretty dry and are not sweet. They don’t taste bad, they just shouldn’t be labeled as a blondie. Hi Kristin, thanks for letting me know about your trouble with the recipe! I’ve discovered that different types and brands of nut/seed butter have different fat contents and that dramatically changes the outcome of the recipe. I use unsweetened, creamy natural sun butter (I’ve also tried it with the equivalent PB). Just before baking, the batter should be thick (but not crumbly). It will not be pourable, but should be spreadable once you get it in the pan. It sounds like there was an issue of too little fat, which is what creates the gooey, soft texture in the center (almond milk would not have created this, because it doesn’t have enough fat). Perhaps your sunbutter wasn’t stirred well enough or something. 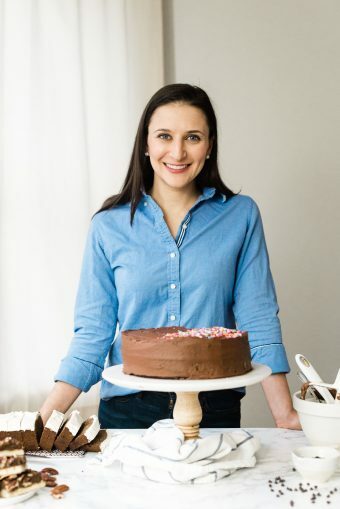 As for the sweetness, since people’s taste for sweetness and tolerance for sugar tend to vary widely, the recipes you’ll see here tend to be on the less-sweet side, with an option to add additional granulated sweetener to taste, if desired, as noted in the recipe. All that being said, though, I have been working on re-formulating the recipe for a larger batch, so that it can be baked in a standard 8″ square pan. Part of the adaptation was to increase the proportion of honey in the recipe, so you may like this version better, if you care to try it again. I’m really sorry this one didn’t work out for you and I hope the above info helps! I actually enjoyed the recipe. I made them today. I didn’t put the coconut sugar although I purchased it for the recipe. I will try it the next time. It’s not as sweet as other desserts but that’s the whole purpose of eating healthy. Thanks for sharing!! I’m thrilled to hear that you liked these, and thanks for leaving me a note to let me know! I agree that they’re very subtly sweetened, but you can definitely feel free to add some coconut sugar next time to see if you like a little more sweetness. In the meantime, enjoy this batch!